But this Friday I’m hungry specifically for bacon (again, who am I kidding, I’m always hungry for bacon, but that’s NOT THE POINT). Maybe it’s cuz I got so excited on Tuesday, when chocolate-covered bacon. Happened. Yes. (I blame my co-conspirator.) In any event, in anticipation of the bacon possibilities of this weekend, I did a quick bacon-centric Google search. 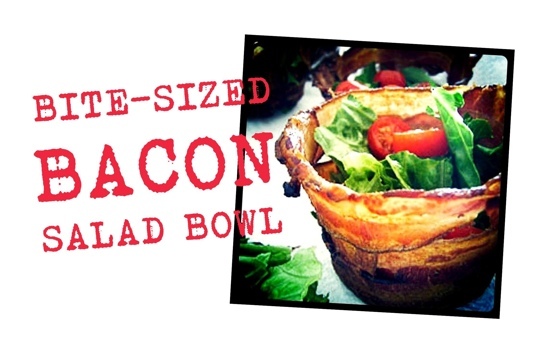 Gleeful isn’t the WORD to describe how I felt when I stumbled across Not Martha’s adorable bacon cup tutorial. I mean, first of all, it’s BACON. Secondly, it’s BACON. And third, it’s bacon in tiny adorable cup-like shapes that you can PUT THINGS IN!! As shown in this pic I nabbed from her (many thanks to the illustrious Megan at Not Martha for this lovely shot), you can add a lil’ L and some T’s and you’ve got some cute little BLT cups; or, as my excitable imagination is dreaming about, why not throw an egg and some cracked black pepper in there? Or maybe some Guinness gelato, chopped nuts and a little dark chocolate? Et cetera. I’d like to order service for eight, please!